On Saturday morning, students went on a short walk to a fossil site just outside TBI. 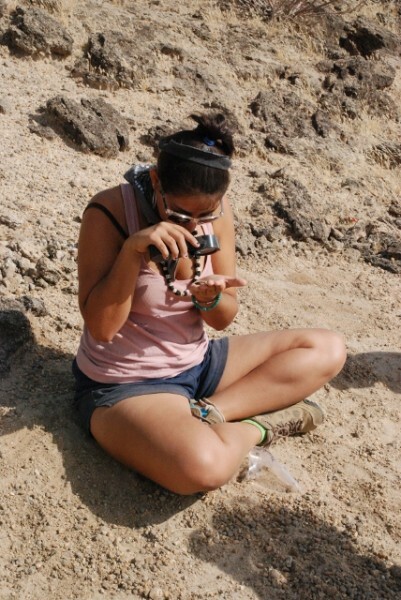 Here, Dr. Meave Leakey taught three different methods of locating fossils. The students had great fun and only reluctantly left for lunch after searching for fossils for over three hours! The ground was littered with fossils, and many, many fossils were found. Most were fragments of mammal and reptile bones, some of which were tiny! Finds also included intact crocodile teeth. This afternoon, students will identify the heaps of fossils, so stay tuned for the next blog report. 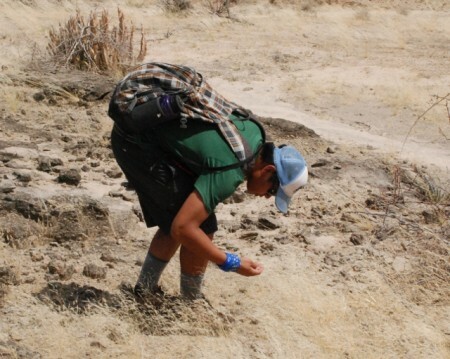 The first method of finding fossils is called “Hill Crawl”. First a small square is laid out. Then students crawled up the square very slowly, picking up any fossil they came across on the surface. 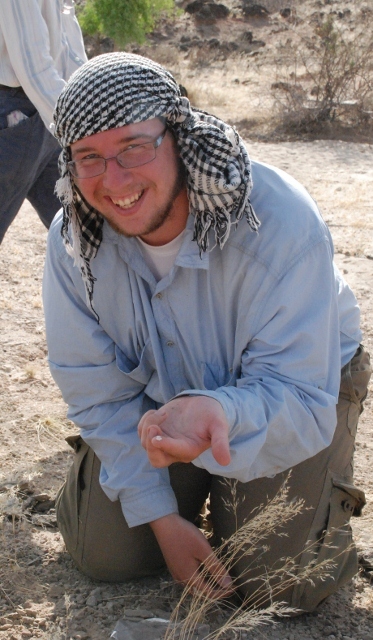 A Hill Crawl can be rough in the 100+ F heat - but finding fossils is fun! Michelle having fun - "wish Mike was here"
The Hill Crawl from a different perspective. The second method also involves a square, but here surface soil is swept up and is then sieved. Sand goes through, but larger objects, including fossils, remain in the sieve. Michelle, Eli, Brittany, and Alexa separating fossils and rocks- not always that easy! Anna and Chelsea shaking things up. The third method iwas a transect walk. Here students walked a straight line for 100 meters, keeping their eyes focused on the ground to spot fossils. This was the most successful method that day, yielding bags full of fossils. Did you find a fossil Robert?